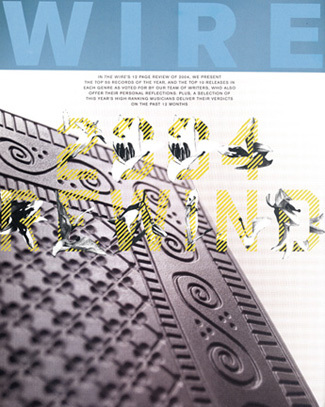 In the Wire's 12 page review of 2004, we present the top 50 records of the year, and the top 10 releases in each genre as voted for by our team of writers, who also offer their personal reflections. 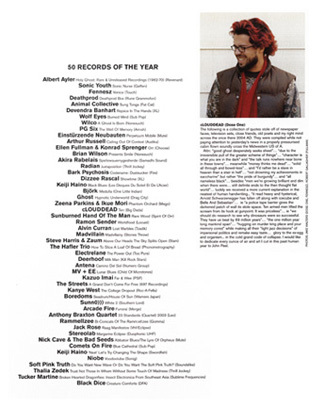 Plus, a selection of this year's high-ranking musicians deliver their verdicts on the past 12 months. The following is a collection of quotes stole off of newspaper faces, television sets, close friends, old poets and my right mind across the once there 2004 AD. They were compiled while not paying attention to yesterday's news in a properly pressurized cabin flown soundly cross the Midwestern US of A.
Attn: "good ghost desperately seeks sheet"… "due to the irreversible pull of the greater scheme of things" … "character is what you are in the dark" and "the talk runs nowhere near bone in these towns" … meanwhile "money thinks me dead" … "solid all through and bowel-less … and "I'd rather be a slave in heaven than a stair in hell" … "not drowning my achievements in saccharine" but rather "the pride of burgundy" … and "all nameless black" … besides "men we're growing brilliant and dim when there were … still definite ends to the then thought flat world" … luckily we received a more current explanation in the neatest of human handwriting … "it read heavy and hysterical, Arnold Schwarzenegger has fallen off along with icecube and Belle And Sebastian" … ie "a police tape barrier gives the darkened patch of wall its stole space. Ten armed men lifted the scream from its hook at gunpoint. It was priceless" …ie "we should do research to see why dinosaurs were so successful. They have us beat by 69 million years" … "the one million year long mankind span" … "hugging on murder king place and your memory cored" while making all their "light jazz decisions" of impersonal politics and remake easy taste… glory to the ex-egg and organism… in the cold grand code of collapse. I would like to dedicate every ounce of air and art I cut in this past human year to John Peel.